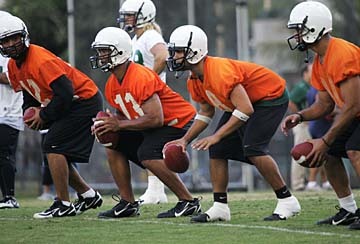 UH quarterbacks Kiran Kepoo, left, Bryce Kalauokaaea, Jake Santos, and Inoke Funaki practiced their form yesterday. While Inoke Funaki is still feeling his way around as Hawaii's initial leader on offense in spring practice, Tyler Graunke will do his best to look beyond a couple of balls thrown in the dirt. The top two candidates to emerge as Hawaii's starting quarterback in spring practice carried a tone of cautious optimism after the first of 15 sessions incorporating new facets into the Warriors offense, including almost exclusively taking snaps from under center yesterday. All things considered, the Warriors have reason to be positive based on the reasonably sharp performances of all six candidates vying for the starting quarterback position. "We've got a long ways to go, but it's good to get started," new offensive coordinator Ron Lee said. "We've got some tape, we can look at practice, make adjustments. It's our first day with a lot of fresh faces. So, I think today went well -- at least we didn't hurt anybody." Graunke and Funaki are experienced in the shotgun snaps favored by former coach June Jones, but haven't taken many snaps under center since their high school days in Tucson, Ariz., and Kahuku, respectively. "Feels a little rusty today, actually," said Graunke, a senior. "First couple balls I threw were right in the dirt and ... I haven't done quarterback footwork drills in years. It's going to be tough, but I'm going to do it. I'm feeling better every day. I'm just excited about what we got going here." Funaki, a junior, laughed when asked about his first practice as the top signal-caller on the depth chart. "It was good, it wasn't horrible," Funaki said. "It wasn't the worst day I've had. A lot of the boys are all pushing each other, trying to get better. It's a pretty good first day, I'd say. We just want to keep things moving up the ladder." New quarterbacks coach Nick Rolovich had the quarterbacks moving and shaking early and often yesterday, swaying forward and back in imaginary pockets on his command and launching balls after dropping back, a motion alien to taking snaps in the gun. Some balls sailed well over their intended targets' heads, but by the end of the 2-hour practice the players appeared more comfortable operating with the full offensive unit. "Your feet have to be under you and your feet have to be real quick because your arm has to be ready to throw," Graunke explained of operating under center. "It's different seeing the whole field -- you're more focused on one spot. But those things will come, and it'll feel just as normal as shotgun once spring ball's over." Freshman Shane Austin entered the day as the third-string quarterback, and split reps about evenly with senior Jake Santos. Redshirt freshmen Kiran Kepo'o and Bryce Kalauokaaea saw action on a more limited basis. Lee said the coaches don't intend to mix offense and defense until Thursday, allowing enough time for each player to grow accustomed to their new roles. Funaki, in perhaps the most visible new role, has absorbed some good-natured grief about his top position. "They kind of joke around and tease me, 'Oh, No. 1 Guy,' trying to make me feel different," he said with a grin. "But we're all boys, we just joke around. It's still the same, the feeling between us boys. I don't want them to treat me any different. That's just where the coaches have me, it doesn't change the person I am."